Accurately modeling payoffs requires us to face the question of exactly how the fronton makes its money. Running a professional jai-alai fronton is an expensive proposition, employing several hundred people. Each fronton has a stable of at least 30 professional players who insist on being paid, as do the cashiers, cleaning people, management, and stockholders. Admission to a fronton costs only a few bucks, so even 1500 paying spectators per match does not provide much of a revenue stream. The total amount of money in the pool is $150. After the house deducts its 20% cut, the pool is left with $120 in it. Suppose that number 1 wins the match. The payoff will be $120/$10 = $12 per dollar invested on the winner, so a bet of $3 would pay off $36.00. If number 4 had won the match, the payoff per dollar would only be $3, and so a $3 bet would pay off $9.00. The odds reported in the newspaper or on the tote board refer to the amount paid off on the house's minimum allowable bet, typically $2 or $3. Now suppose number 7 had won the match. Since no one bet any money on this possibility, typically the price of all win tickets would be refunded, although the exact policy depends upon local rules. This is a rare, but not unheard of event - it occasionally happens in very early or late matches which have fewer customers. In addition to the 15-20% deducted from the pool as house advantage, the fronton also profits from the breakage, the odd cents left over when dividing the pool. For reasons of either convenience, tradition or greed, all payoffs at the track or fronton are given as multiples of 10 cents. You see payoffs of $14.40, but not $14.47. So what happens to that extra $0.07 per winning ticket, whenever the pool works out that way? The answer is that it is deducted as breakage, and is split between the state and the fronton according to prevailing local laws. These pennies certainly add up. It works out to, on average, a nickel per winning ticket, thus adding another percentage point or two to the house advantage. This nickel works out as a lower percentage of exotic bets such as trifecta, since it is a negligible fraction of the payoff, but represents a more serious cut of the win/place/show payoffs. The computers used today crunch out these payoff computations in a fraction of a second. Thus payoff results are typically posted within a minute of the completion of each match, somewhat faster than in years past. But in those pre-computer days, the money counting and pool computations had to be done by hand. That they were performed quickly and accurately enough to satisfy impatient and suspicious gamblers was a feat worthy of our respect. There are several interesting implications of the parimutuel system. First, the exact payoffs for any bet are not known to anybody in advance. To estimate the payoff you will receive, you really have to know how other people are betting. For this reason, every fronton or racetrack has an electronic scoreboard or monitor which flashes the current odds for each possible wager. Many ``professional'' gamblers make a careful study of the odds board and place their bet at the last possible minute, investing in players who seem undervalued by the rest of the betting population. Observe the difference from casino games, where you always know that a correct bet on black in roulette pays off at two to one, regardless of how many other people have also invested on black. Because of the parimutuel system, every bettor can theoretically pick the winner in jai-alai and the fronton still makes money.7.1 This is not true of casinos, and to my way of thinking makes frontons much friendlier places than casinos. Frontons want you to bet, while casinos want you to lose. This may seem meaningless distinction, since casino odds are sufficiently stacked against you that the more you bet the more you are almost certain to lose. However, it shows up clearly in how the house deals with systems bettors. Every casino employs a large security staff with sophisticated surveillance equipment who watch any successful bettor's every move. If they find you using any forbidden equipment (like a computer in your shoe) or any successful mathematical technique (like card counting in blackjack), you will be tossed out on your rear hard enough to know never to come back. Now conversely, suppose I showed up at the fronton with my laptop computer and a system guaranteed to make money betting on jai-alai. Management would welcome me with open arms. The house keeps 20% of everything I wager, and I must spend money to make money. If I were successful, I would just be taking money from other bettors, but this is none of the fronton's concern. Ollier's parimutuel system caught on quickly in France, but was initially unpopular in the United States because bettors then (as now) wanted to be able to bet on long shots which paid off (if successful) at high odds. Under the parimutuel system, whenever many people bet on a long shot, it ceases to be one. Other bettors feared that the house would manipulate the calculations to skim off more than their allotted share. Once the tide started shifting against them, bookmakers tried to compete by paying off at the same odds as the race track, with the added advantage that your bets would not depress the payoffs as they did when you bet at the track. Sharpies took advantage of the situation by investing relatively small amounts of money at the track on everything except the horse they wanted, and then large amounts at the bookie on their favorite. Their preliminary wagers skewed the small pool so that their real horse paid off at greatly inflated odds, which the bookie then had to match. One by one, these bookies were put out of business, and now the parimutuel system reigns throughout horse racing and jai-alai. I hope you have enjoyed this excerpt from Calculated Bets: Computers, Gambling, and Mathematical Modeling to Win!, by Steven Skiena, copublished by Cambridge University Press and the Mathematical Association of America. This is a book about a gambling system that works. It tells the story of how the author used computer simulation and mathematical modeling techniques to predict the outcome of jai-alai matches and bet on them successfully -- increasing his initial stake by over 500% in one year! His method can work for anyone: at the end of the book he tells the best way to watch jai-alai, and how to bet on it. With humor and enthusiasm, Skiena details a life-long fascination with the computer prediction of sporting events. Along the way, he discusses other gambling systems, both successful and unsuccessful, for such games as lotto, roulette, blackjack, and the stock market. Indeed, he shows how his jai-alai system functions just like a miniature stock trading system. Do you want to learn about program trading systems, the future of Internet gambling, and the real reason brokerage houses don't offer mutual funds that invest at racetracks and frontons? How mathematical models are used in political polling? The difference between correlation and causation? 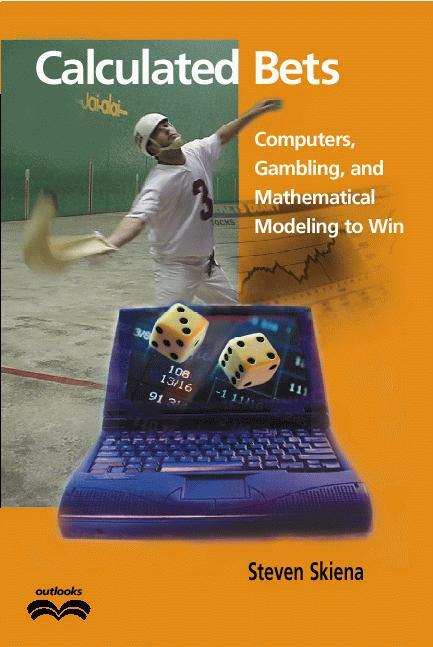 If you are curious about gambling and mathematics, odds are this is the book for you! This book is available in both hardcover and paperback.